Pause Game. Rome will demand timber so it is crucial to get that started right away. There are three forests and the central one will be enough for Romes demands. The resources available are iron, gold, clay and of course the trees. We can also grow olives, grapes, keep sheep and cattle. The only resource we cannot refine is gold but we can export it as is to Latium. 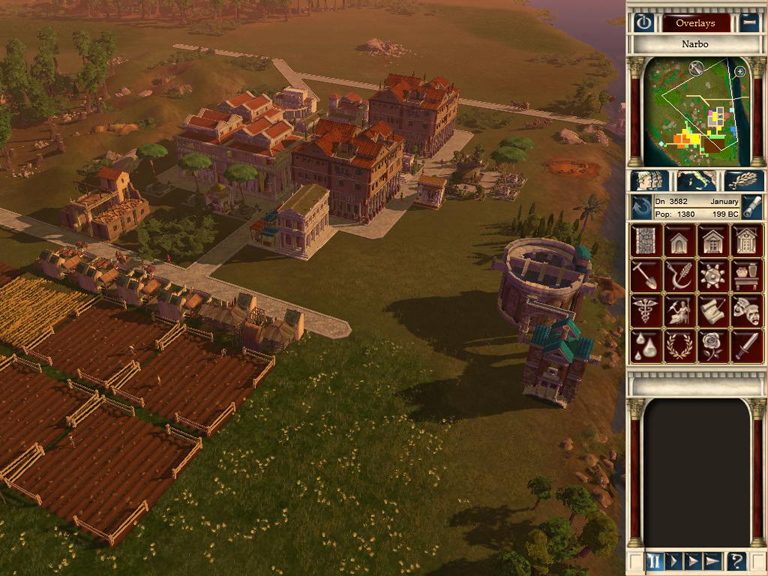 The objectives for Narbo is very similar to the ones of Syracusae, which means a minimum of 6 large insulae and 3 medium domus will be enough. There are a few places to build the housing block but none seem better than between the bridge and the large farmland. One thing to note is that a gatehouse and small wall blocking the bridge may be needed. Narbo will face raiders if the raiders are not bribed. I build my small block with the most basic features such as prefect, engineer, fountain, clinic, food market (mothballed), basic goods market (mothballed) and a tax office (mothballed). 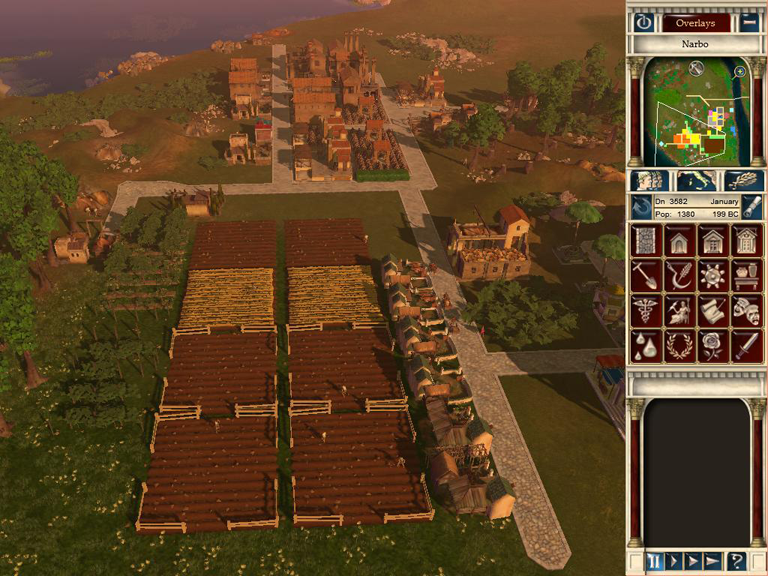 I start by placing 2 vegetable farms, 2 grain farms, 1 grape farm and 1 olive farm on the smaller farmland to the south-east. I choose olives over sheep since they grow slightly faster and the groves take up less space compared to paddocks. A gold mine and an iron mine are placed near the southern-most mines and a clay digging camp is placed at the far west pit. That way desirability stays intact near my houses. 2 timber cutting camps are built near the trees of the smaller forest and a warehouse (mothballed) set to only accept timber. Trade routes to Latium and Cisalpine Gaul are opened and I place the trade ports near the iron mine. 1 of each olive, wine and pottery factory are placed and mothballed. Unpause game. Watch how people flock to Narbo. My workforce is 3 plebs short. Despite this I open the granary and let it collect goods to keep the flow. Once the olives and grapes are ready and stored in the farms I mothball both of them and open up the pottery factory. 1 pleb is still missing. When I realize that the warehouse is still mothballed and timber can't be stored I give in and build a 7th insulae. In June the iron camp is mothballed in favour of letting the workers work at the trade post to Latium. I start export gold. Shortly thereafter the 7th insulae is full of people. The city has a large stock of food and the first pottery is ready so I open the food market, basic goods market and the tax office. When my warehouse is full of timber I mothball it and let the workers go to the Cisalpine Gaul port. There are enough workers by the end of the year to open the olive oil factory, reopen the iron mine and the olive farm, and build a second warehouse (for timber). The new year starts with a burning pottery factory. 1 prefect and engineer later everything calms down. March arrives and still no demand for timber from Rome. I decide to start selling some timber to Latium and I set the restriction to 40 to be on the safe side. With an unemployment of nearly 100 plebs it is time to reopen the grape farm and start producing wine. I add a luxury goods market in May and mothball it until I have a small stock of wine to sell. 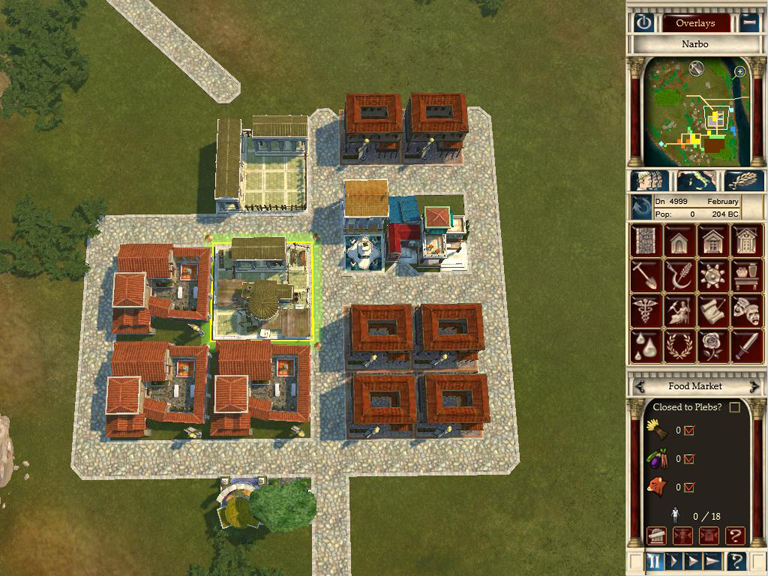 June arrives and the evolving of insulae is a bit on the slow side due to lack of goods so I build another pottery, olive oil and wine factory. By August the Domus have bought wine and are evolving. They get an odeum and a school to occupy them. Since I have enough workers for a weapons factory I build one of those. The very first demand of timber comes in September and it's a tall order of 100 units. I immideately change the export restriction to 110 (I have 70) and build a warehouse and a timber camp. Deadline is 1 year and 6 months. The trade route to Apulia opens up in February and the port is built. Time to export weapons! 13 plebs are missing. Time to build an insulae. In February Rome demands weapons. I immideatly increase the export restriction to 25. I also build a second factory to quicken the production. The deadline is 1 year. The stockpile of timber is higher than what Rome demands so I ship it. In June raiders are at the border and demand payment. They get what the want. I let the rest of the year pass just watching the stockpile of weapons build up. In January the stock of weapons is large enough to ship the order. Timber builds up slower with the added weapons factory and I counter this by adding a timber camp next to the olive farms to the far south. In April half of the wine, olive oil and pottery production is mothballed to save money (expenses were greater than the income). All factories were at a standstill because production was higher than the demand. I build a shrine to Mars in hopes to benefit from his strength (incrased production of military supplies). I build a third factory when I notice the benefit never happens. With 1 month and some odd weeks to spare I ship the weapons to Rome. Iron is in short supply. Time to build another mine. Raiders arrive in June and I pay them off. The rest of the year pass by without any major changes (only beautification). January - Rome requests weapons. I have plenty so I ship the goods right away and win the scenario.